Not too far from Massachusetts Avenue or Meridian Street, the 400 and 500 blocks of North Delaware Street were quiet and full of single family homes, duplexes, and flats. Although not a centralized location, the area was quite accessible because of the 1890-established street car system. The Arundel, Vendrome, Delaware, and Colonial flats are all similar in style and mostly in materials. 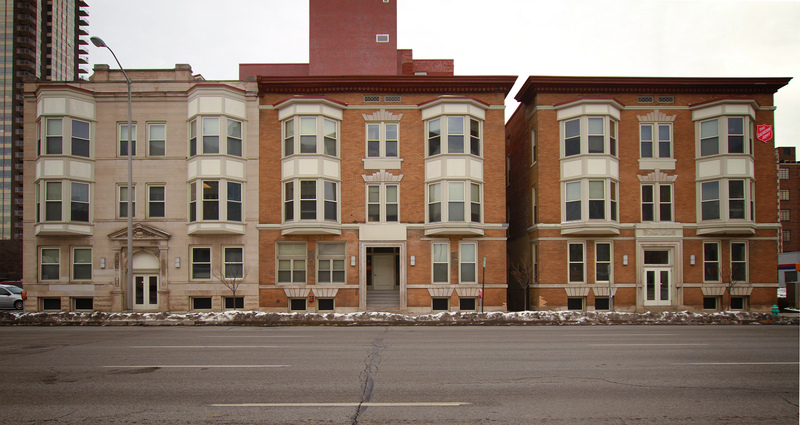 All built in 1902, the Arundel, Vendrome, and Delaware Flats were built at 507, 505, and 503 North Delaware Street. The Delaware was constructed by Charles A. Wallingford, a local architect; he constructed many flats and homes in the downtown Indianapolis area. The Vendrome was constructed by H.A. Metzger, an insurance agent. Lastly, the Arundel was constructed by Adelaide G. Dale. Originally, these three flats were separate structures, not joined anywhere in between. The three façades are very similar on the Delaware Street side, with a few differences in the Arundel, particularly with the materials. There are three bays each on this side of the street – a middle entrance with flanking bay windows; each flat is also three stories of twelve feet plus basement. From this side, they all look like Eastern-style flats with similar bay windows. They are a simplified combination of Beaux-Arts and Neoclassical architecture, when one considers the modest embellishments above the third story windows, the low-pitched roof, and the basic keystones. The Arundel has lost its simple balustrades and contains fewer details above the middle bay and basement windows. Additionally, the Arundel is faced in limestone, while the Vendrome and Delaware are faced in yellow brick. 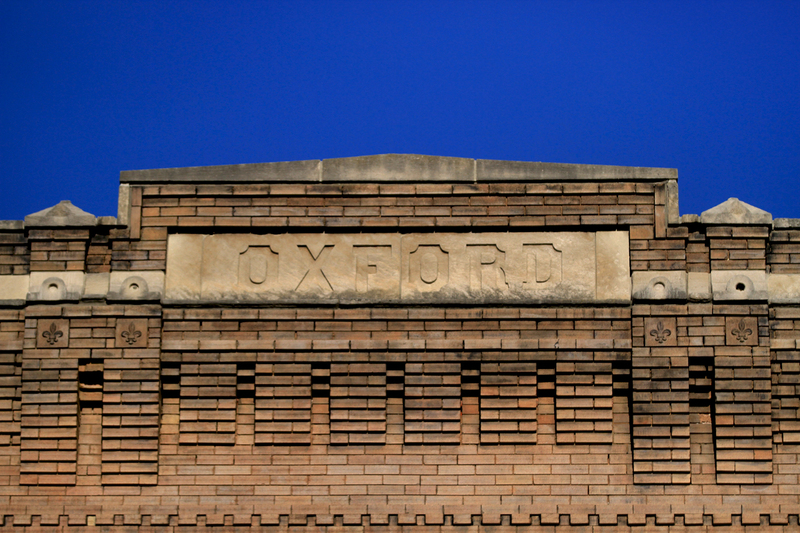 Each flat has a different pediment above their entryways. The Delaware Flats’ façade on the East Michigan side of the street are much more asymmetrical; it has five polygonal bays. The Delaware contains eighteen flats, each of five rooms. Inside retains much of the original woodwork on the upper floors, such as window and door trim and baseboards. This area, far removed enough from the commercial district of Washington Street and the shopping corridor of Massachusetts Avenue, was very much saturated with domestic lots in 1898. In June of 1911, the Delaware Flats were purchased by local contractor Lynn B. Millikan, according to the article, “Real Estate Transfer Record: Delaware Flats Sale Filed.” Millikan purchased the flats from John and Phillip Owen for $46,250 – $21,250 plus the $25,000 mortgage. The article stated that he planned on making extensive improvements over the next three months. Just from 1906-1907, Millikan had done one million dollars worth in business in the city. On October 25, 1911, Dr. Helene Knabe was murdered in the Delaware Flats. According to the article, “State Officials Pay Tribute to Dr. Knabe as Woman and Scientist,” she was an assistant in the hygiene laboratory at the State Board of Health. Born in Germany, she graduated from the Medical College of Indiana in 1904; she was a bacteriologist and a pathologist. She was a “fighter against the social plagues” especially those sexually related – she was doing some of the earliest sexually transmitted disease/infection work in the city – a taboo at the time. She quit the State Board of Health to begin her own practice; she criticized her previous employer because the State Board of Health “expected an employee in the laboratory to have a man’s brain, but be paid a woman’s salary.” This much-publicized murder left the police baffled as they could not find any evidence or a motive. It was said the next day in “Hunt in Vain for Clues in Murder Case” that Dr. Knabe wanted to improve the social conditions for women. She also provided medication and treatment to patients who could not pay. Two years later, Dr. William B. Craig, a local veterinarian, was put on trial for Dr. Knabe’s murder. The 1913 article “Lawyers Clash at Craig Trial” stated that he broke his engagement off with Dr. Knabe to marry another woman. His maid reported that he came home late the night that the doctor was murdered, and he left early in the morning carry a bundle that the prosecution believed was evidence. However, the prosecution could not prove a motive or prove that the two were even more than friends, so Dr. Craig was acquitted. Additionally, the Indianapolis Star published a handful of articles about tenants moving out of the Delaware Flats after the murder. 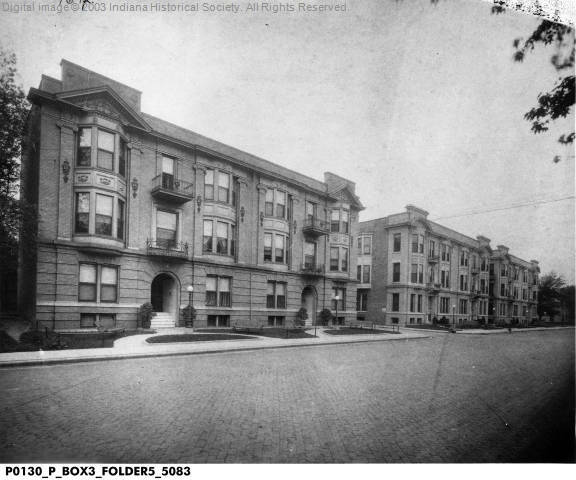 In 1913, the Arundel Flats were used in a financial scam: Garey Haynes, a salesman for the Columbia Casualty Company, was charged in Indianapolis with embezzlement and grand larceny. The president and treasurer of the company were also arrested for these charges as well as selling stock double its face value. In April of 1913, Haynes purchased the Arundel Flats for $33,000. He then made a pretend sale of the building to the company for $80,000, pocketing $47,000 for members of the company and himself (“Dramatic Catch Ends Long Chase.” Indianapolis Star. 12/17/1913). After buying the Delaware Flats in 1911, Lynn B. Millikan had an opportunity to buy the Vendrome in 1913. Presumably because of the well-known murder or for financial reasons, he rebranded the flats as a hotel and built an additional structure in the rear. 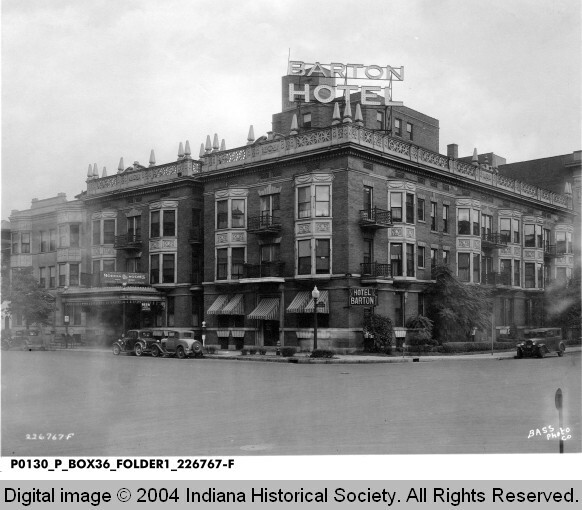 Hotel Barton had a dining room and kitchen on the first floor in the back, which remains intact. The central lobby also is mostly intact. Other renovations done at this point were adding egg-and-dart molding to the lobby and some guest rooms and adding decorative mirrors and fire places. The basement and first floor of the Delaware Flats were utilized for commercial space, such as a barbershop, a tailor shop, and a tavern (NRHP Nomination Form, Apartments & Flats, Indiana Landmarks). By 1924, Millikan was able to purchase the Arundel Flats, at that time called Hotel Argonne. 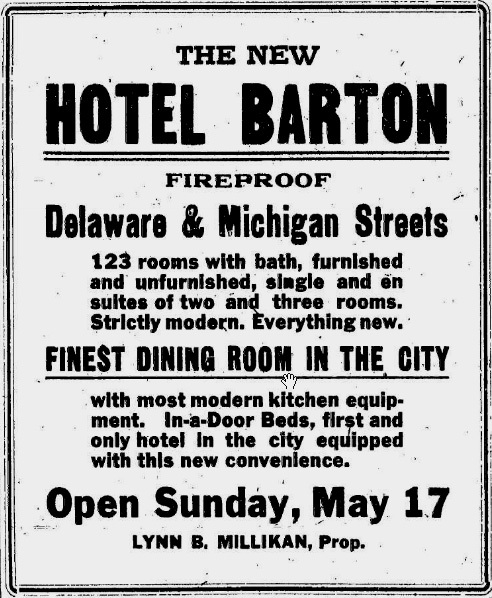 One advertisement from the Indianapolis Star in 1914 describes the hotel’s opening: “the new hotel will cater to the traveling public, has one hundred rooms equipped with baths. J.N. Millikan, a brother of the proprietor, is manager.” In 1924, advertisements boasted the completion of the Hotel Barton’s tower – a seven-story brick structure. A seven-story structure was incredibly uncommon on this part of town at the time; it could be seen for many blocks. By 1950, many of the lots near Hotel Barton had been cleared for parking lots and more commercial buildings. Across the street was the Indiana University Downtown Center Building. In the early 1960’s Hotel Barton became Barton House Hotel. In 1966, it was a nursing home. After that, the Salvation Army converted the three buildings into thirty units for low-income families; they had purchased the buildings as well as the Carpenter Apartments next door for $500,000 each in late 1999. Some space on the main floor is utilized today for the organization’s programs for the Indiana division. 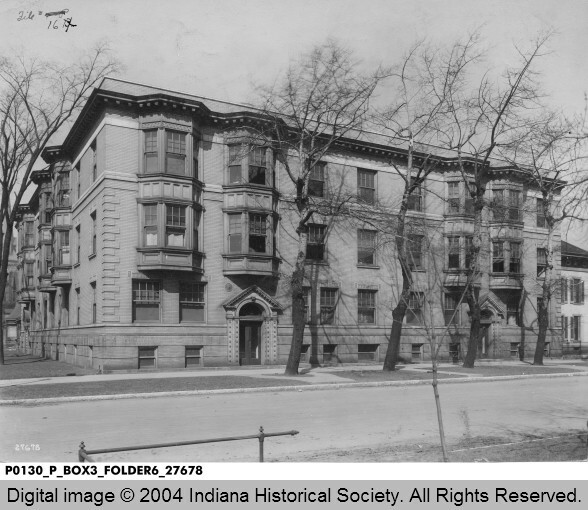 In 1900, the Colonial Flats were built at 400-406 North Delaware Street and 126-134 East Vermont Street. This three-story eight by ten bay building has elements of Beaux-Arts style and Classical Revival style. 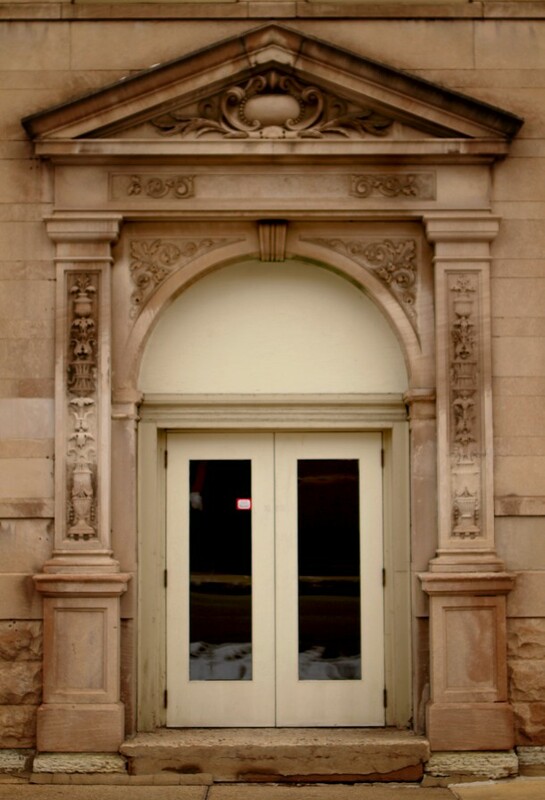 There are three entrances to the building, two on Delaware Street and one on Vermont Street. There are three polygonal bays on Vermont Street and four on Delaware Street. The façade is symmetrical on Delaware Street but asymmetrical on Vermont Street. This enlarged Eastern-style flat plan has twelve-foot ceilings and two flats on each floor within each entrance. Originally, each unit was very different in size and layout. 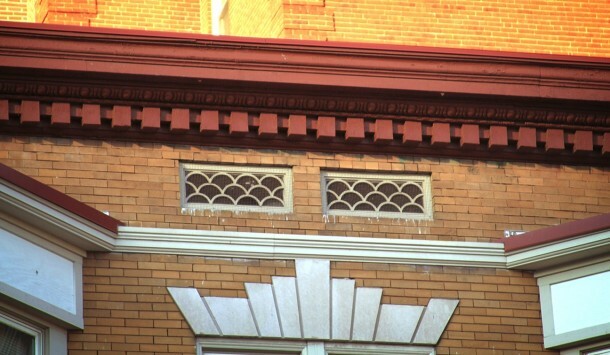 Some Beaux-Arts elements of the building include the flat roof, brickwork that imitates quoins, rusticated basement, and detailed stonework in columns and pediments. Unfortunately, this yellow brick and cream-colored terra cotta flat has had its second and third story bays altered slightly; some details in the bay windows and cornice have been removed as well. The lintels are very detailed, with a little bit of Egyptian flair. 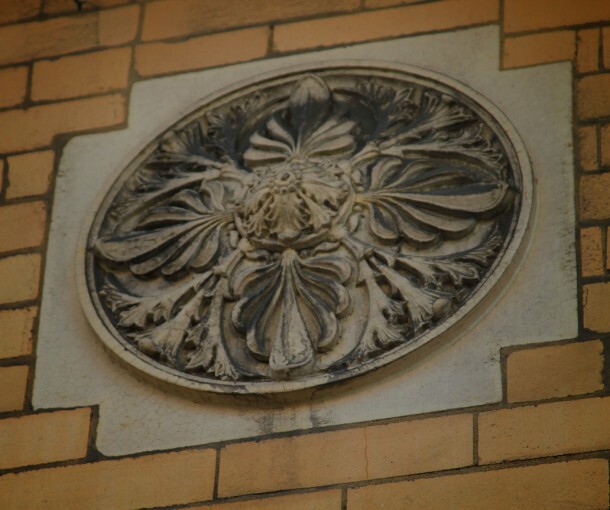 On either side of the pediments are medallion-sized rosettes. According to the National Register of Historic Places Nomination Form for Apartments & Flats, the third story once had a metal cornice of large modillions. Another interesting feature is the sunburst transom lights above the double glass entrance doors. Like the Arundel, Vendrome, and Delaware, the area, a prime location between commercial and shopping districts, was mostly domestic lots around the Colonial in 1898. 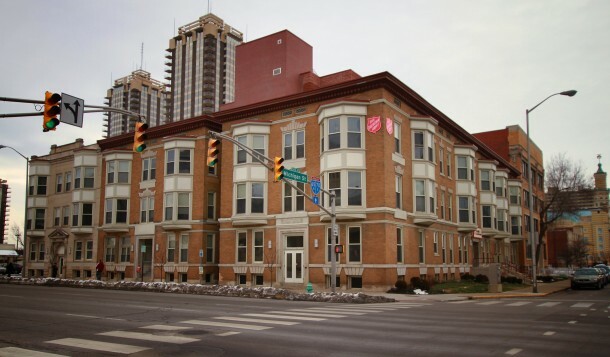 In 1900, Catherine Francis Zener built the flats as an investment; her husband had died less than a year before (NRHP Nomination Form Apartments & Flats, Indiana Landmarks). 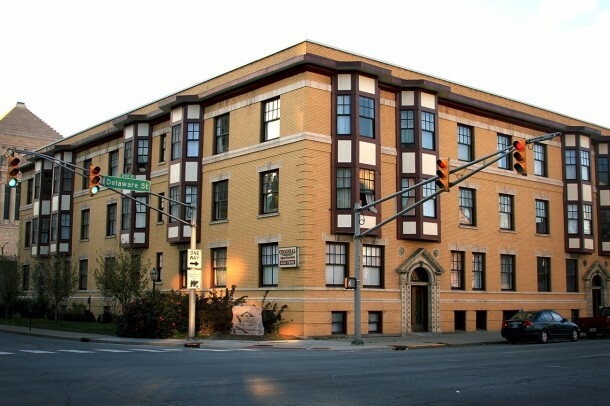 John A. Schumaker constructed the flats for $37,000 in February of 1900 (NRHP Nomination Form Apartments & Flats, Indiana Landmarks). Schumaker came to the U.S. in 1861 from Germany to form a construction company with William Jungclaus, his brother-in-law – by 1895 the partnership was dissolved to make room for their sons in the businesses. The Colonial was quite spacious at the time, advertisements from the early 1900’s boasted that it contained six to seven room apartments. 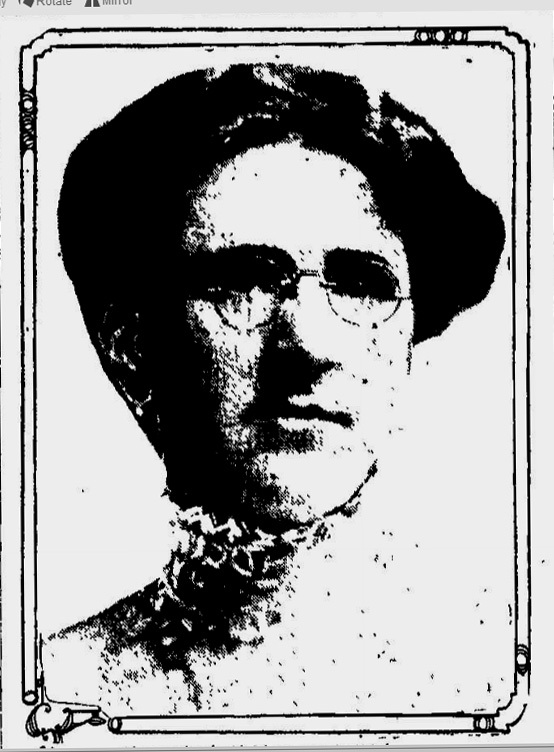 On August 12, 1912, Mrs. J.H. Tolles, wife of member of the firm Tolles & McQuhae and proprietor of the Factory Hat Store died there. 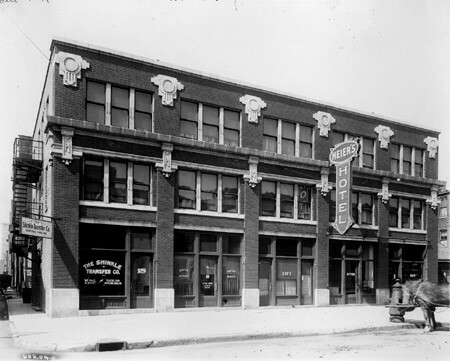 Located at 240 Massachusetts Avenue, the Factory Hat Store was a high-end accessory store specializing in hats near Stout’s Shoes. In 1914, the area was dense with residencies, businesses, and many other needs of the locals: there was a YMCA at Pennsylvania Street and Vermont Street, the Scarborough Map Company across from the flats, and Roberts Park Methodist Church on the other side of Delaware Street. The RPMC’s current parking lot was the location of the Bertha Ballard Home for Girls. 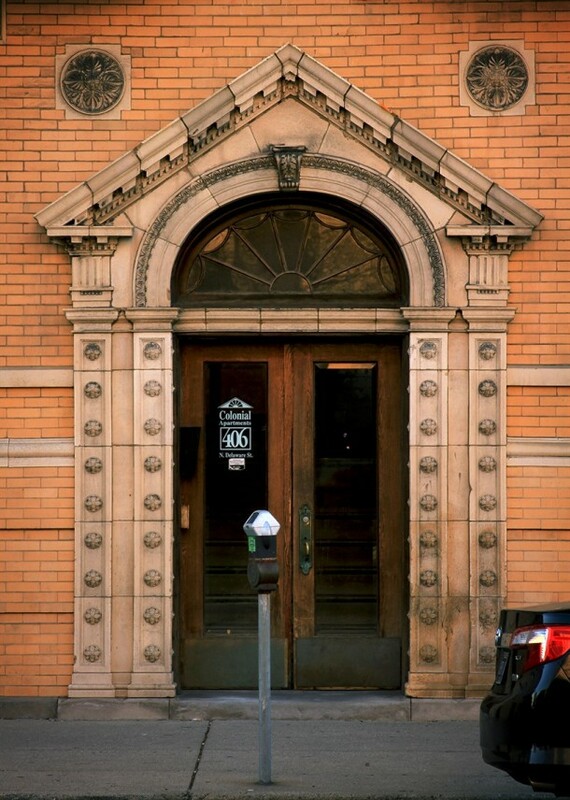 By 1916, Volney Thomas Malott owned the Colonial Flats; he was also the founder of Merchant’s National Bank, the oldest banking institution in the city. John S. Spann Company took over ownership by 1925 – a firm long involved in real estate and insurance. 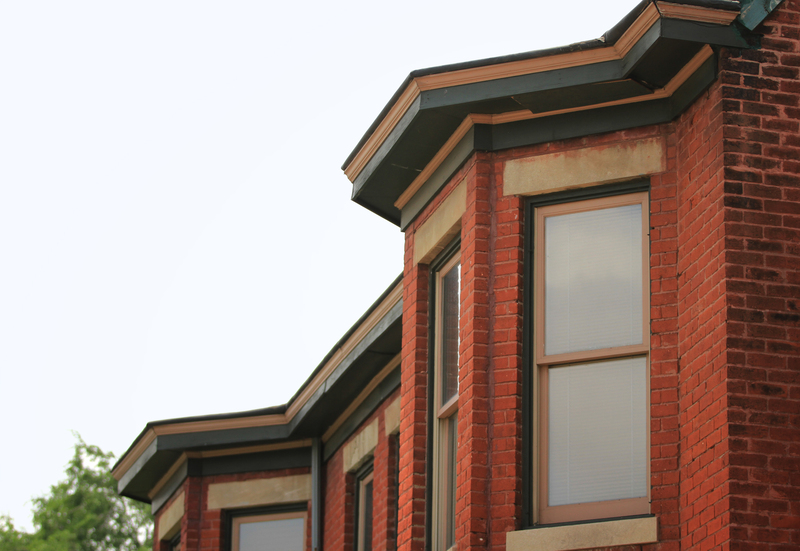 Recently, the Colonial Flats received a facelift, including a new paint color on the wood trim. Thanks for the information on Charles Wallingford. I wasn’t aware of his connection to anything still standing and his career has always intrigued me since I discovered he is buried in an unmarked grave.FYI, Historic Indianapolis reader Nici Kobrowski is the expert on Dr. Knabe, whose grave is now marked thanks to Nici and Michael’s efforts. Charles Augustus Wallingford (February 3, 1854 – March 21, 1909) Buried at Section 33 Lot 61 in Crown Hill. High praise, and yet for the past one hundred years, Charles Wallingford has lain quietly in his unmarked grave while his works (and it was hard to find any specific references to his local works) have all gone the way of the ice palace he designed for the 1887 St. Paul (MN) Winter Carnival. No matter how substantial they might have been, they have vanished with scarcely a trace. Born in St. Louis to Estes and Catherine Wallingford, he came to Indianapolis with his parents while still a young boy. It was in Indianapolis that young Charles bid his father, an adjutant in the the 33rd Indiana Volunteer Infantry, his final good-bye. Estes Wallingford was captured and died in Libby prison in Richmond, Virginia. And it was in Indianapolis that young Charles received his public school education before going to the U. S. Naval Academy. When his naval service was over, Wallingford returned home and studied architecture under Edwin May. He began his professional work as an architect here, but soon moved to St. Paul, Minnesota, where he designed a number of important business buildings, private residences, and, something he surely could not have done had he remained in Indianapolis, the 1887 ice palace. Other work done while residing in St. Paul included the Lewis and Clark County Court House in Helena and a large bank building in Fargo, North Dakota. Wallingford returned to Indianapolis in 1896, and, according to Dunn’s History of Indianapolis, “furnished the plans and working specifications for many residences, apartment houses and business blocks in the capital city [and] for important buildings erected elsewhere in the state.” (p.961) Among those buildings that once stood in Indianapolis before making way for later progress were the Marion Apartment Building at Tenth and Meridian; the Willoughby Building, also on north Meridian; and the residences of J.W. Schmidt at 1304 N. Delaware, Robert Geddes at 1117 North Delaware (lost for I-65); and Arthur Jordan at 1423 North Meridian. Mr. Wallingford also served as a delegate to the World’s Congress of Architects in London. I believe that Moore died around 1895 or so. His wife and son lived there until they both died in 1918. I’ve always wondered if they died in the Influenza pandemic. It was a very fascinating house, in spite of the leaky gas stoves and the 1,000+ roaches I had as roommates (they never bothered to chip in on the rent either). But being my first apartment, it was a palace to me. I lived in the apartment in the first floor part of the tower. My mother still refers to the place as Faulty Towers. Unfortunately–following a fire a few years ago–it was remodeled beyond recognition. Check out the link, but be prepared for the ghastly horror. This treatise on these flats is outstanding! CAN’T WAIT FOR MORE! Thanks for sharing this information, Tom!